In 2012, we took all the learnings from the past years with batteries and riders and used it to dominate the competition. We won every race that we entered. This was our 2nd year with Enerdel as our battery sponsor and our first year with Barracuda Networks. We started the year with a yellow color theme and then shifted to blue with the sponsorship of Barracuda. 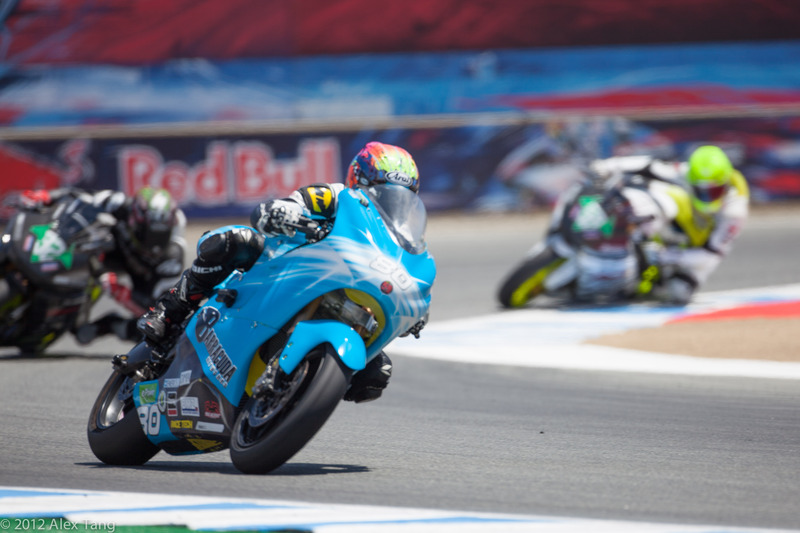 We entered the TTXGP eGran Prix series with the first race taking place as part of the AMA Pro Race at Infineon Raceway, Sonoma CA. We took 1st place in the TTXGP in the 2 races at the event. Michael Barnes and Tim Hunt from Race Tech were our riders. Below are the links to the videos from the race including Michael’s victory burnout in front of the podium and him passing one of the Zero bikes like it was standing still. The second race was at Mazda Raceway Laguna Seca in Monterey, California. Michael Barnes was our primary rider and this was the first event with our blue colors and Barracuda Networks as our sponsor. We did not disappoint. We won the race and dominated the competition. Michael gave the team some major anxiety because on the warmup lap he crawled around the track to conserve battery power and came up to the starting line 2 minutes after all the other bikes had been placed in the starting grid. Michael pulled up to his pole position, stopped the bike, lifted his visor and gave the team a big smile and a thumbs up. Our hearts started beating again. After running out of juice last year he wanted to make sure that did not happen again. When the flag dropped, he took off and never looked back. The end result was another 1st place in the FIM ePower series. See below the link to the video from the race. This was also the first time that we used a solar energy trailer to power our bikes. This was a big trip for the team. We had to ship the bike to Europe and assemble it in France. We designed a specific battery pack that would last the entire race. 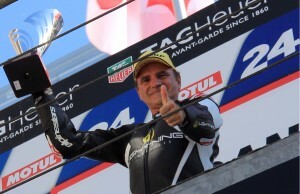 We selected Miguel Duhamel as our rider, a legendary racer and winner. The plan from the start was to fall behind the Munch Racing Team Rider (the reigning world champions from Germany) and draft him to conserve battery. After the start the Munch rider slowed down to make Miguel pass him, but Miguel just slowed down even more to stay behind him. They both continued to slow and fell behind the pack. The German lost site of field and then decided to take off and repass the field. Miguel stayed right behind him, then the German rider ran off the track after looking back at Miguel. The German got back on the track and caught the pack and passed Miguel. Miguel again fell in right behind him. This cat and mouse continued for another lap until the German rider ran off the track again and went into the gravel. 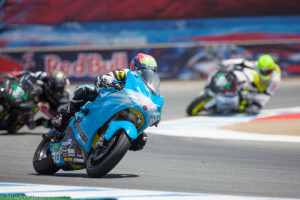 Here we have to digress into the regulations of electric motorcycle racing… each bike must have a Kill Switch or button prominently located so the corner workers can power off the bike in case of an accident. Our bike had the button on top of the tail. The German bike had it under the tail so when the bike went into the gravel it threw a piece of rubber and hit the kill switch under the tail, stopping the bike. Again the German rider restarted the bike and caught up and passed Miguel. Miguel stayed with him again until the last lap and at that time he still had 40% of the battery left so he took off and sailed away from the German rider and then had enough battery left to do a wheelie down the front straight after the finish. The German rider came up to us after the event and claimed that Miguel had turned off his bike on purpose. We looked at his bike and found that there was a black mark on his kill switch where it had been hit by the rubber chunk. 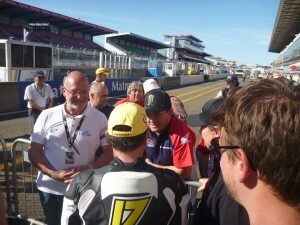 After the race John McGinness (the reigning TT Zero Isle of Man winner) came over to meet Miguel and Lightning and half-jokingly asked us not to bring our bike to the IOM in 2013 because he wanted to win it. We actually complied with his wish and instead we went on to race and win the Pikes Peak International Hill Climb in 2013. We also began working to develop relationships with supply chain partners in Asia for sourcing the major components of the production versión of our bikes. This would pay off in 2013 and 2014. → The Lightning Story: Chapter 6 – 2013 A Record Year! The fastest production motorcycle in the world.